The birth of the U.S. Navy SEALs was inauspicious at best, buried in a speech to Congress on May 25, 1961, by President John F. Kennedy — the same speech that called on the nation to send a man to the moon and bring him safely back to Earth within the decade. It was the age of the Space Race and the Cold War between the United States and the former Soviet Union. Not surprisingly, it was Kennedy’s lunar challenge that grabbed the headlines, not the $100 million that the president announced he would funnel into the military to build up unconventional warfare operations. But by the following March, the first Navy SEALs — special operations forces whose acronym is derived from their intense training to operate from the sea, in the air and on land — were deployed to South Vietnam. There, they trained Vietnam commandos in the same unconventional warfare tactics that they had been trained themselves. Over a 3 -year period between July 1969 and December 1972, a dozen Apollo astronauts did indeed walk on the moon and all found their way safely home. Meanwhile, thousands of Navy SEALs have been working quietly, clandestinely, and effectively, year in, year out for the past 50 years, keeping this country safe, and helping other countries fight for their own freedoms. 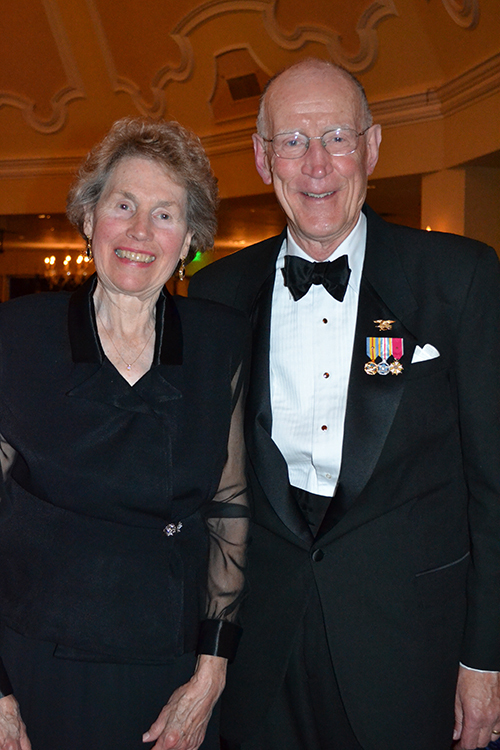 This March, the Coronado Chamber of Commerce paid tribute to the SEALS on their 50th anniversary at its Salute to the Military Ball at the Hotel del Coronado. Keynote speaker for the evening was Rear Adm. Sean A. Pybus, Commander, Naval Special Warfare Command. Pybus is a career SEAL officer who got his Navy commission in 1979, coming out of the University of Rochester. A 1998 Distinguished Graduate of the Naval War College, with a master’s degree in Strategic Studies, Pybus has participated in special operations in Latin America, Europe, Africa and Asia. 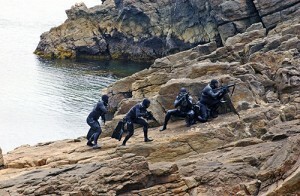 Pybus acknowledged that the anniversary followed a year of extreme highs and lows for these elite special ops forces. Last August, 22 SEALS and eight other Americans, were killed when Afghan insurgents shot down a Chinook helicopter in the most deadly incident for U.S. forces in the 11-year war in Afghanistan. While keeping mum on specifics of SEAL operations, Pybus shared what he considered the top three components to SEALs’ success in its field of operations. First, he pointed to the combination of extensive training, teamwork and a winning attitude, which puts SEALs at “The Tip of the Spear” for the U.S. special ops. 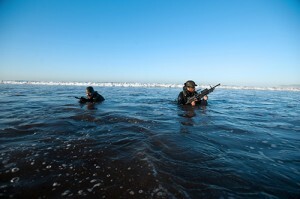 That training happens in large part “down the street on the Silver Strand, a place where only 30 percent of those who enter SEAL training make it through the program,” he said. Second component of success, said Pybus, is leadership from our spouses. “The SEAL community is very close,” he said. “I’ve seen the power of that community. People are attended to after a loss; seasoned spouses help younger wives and loved ones.” He saw the effect of that overall community — 8,000 strong including support personnel — as they banded together following the August tragedy. And he noted, SEALs are more effective in the field when they aren’t worried about their families, and strong spouses make all the difference. Ten SEAL teams and one SEAL delivery vehicle team currently operate in more than 30 countries around the world. And while historically deployments lasted six to eight months, the current “OPTEMPO” (operational tempo) demand for Special Operations has required some recent deployments that lasted 11 months to more than a year. 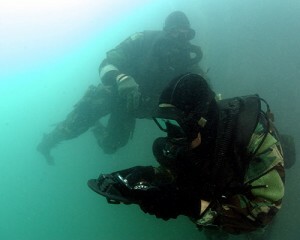 When SEALs return from deployment, they are granted a leave period for family time, then immediately return to training for their next deployment. Today, the cycle is approximately two years. Although specific fields of operation are kept confidential by the military, it is widely known that SEALs operate in war zones including Iraq and Afghanistan. But they are just as likely to be involved in training America’s allied and partner forces in other countries. “That’s why cultural, ethnic and language diversity are so important in our recruitment efforts today,” said Capt. Duncan Smith, a SEAL with four deployments under his belt following 9/11. He is now the lead recruiting officer for the SEALs and Special Warfare Combatant-craft Crewmen (known as SWCCs). 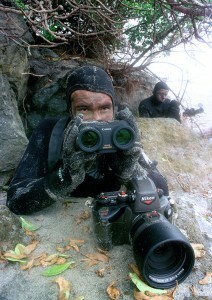 Smith was the point man on the recently released “Act of Valor” motion picture, which the SEALs helped produce as a recruitment tool. Real SEALs and the Navy Parachute Team, which is made up largely of SEALs, starred in a fictionalized scenario of a terrorist organization attempting to smuggle undetectable explosives and suicide bombers into the United States via Mexico. Twenty-five years ago, only 20 percent of SEAL team members were married. Today, the average SEAL is a soldier who has spent eight or nine years in combat. Seventy five percent of SEALs with 10 years or more of service are married, have children and own a home. 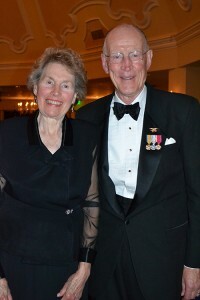 Established just four years ago, The Navy Special Warfare Family Foundation (www.westcoastseals.com) supports the families who are left behind when SEALs deploy. The foundation sponsors family days at the Del Mar Racetrack, picnics and parties, and much welcomed spa days for wives acting as single heads of household for long stretches. For children who are without a father for long periods, members of the SEAL community who aren’t on deployment step into the role of Surrogate Dad, taking youngsters fishing or to the ballgame. Hundreds of kids watched Santa arrive by helicopter at its Christmas party at North Island Naval Air Station last year. Graduation parties for Basic Underwater Demolition/SEAL (BUD/S) classes are arranged. When tragedy strikes, the foundation will assist in memorial costs that are outside the Navy’s purview, such as paying for extended family members’ travel. After the sun has set on another Coronado Sunday, residents may hear what they first think are fireworks. But as they listen more intently, they’ll likely hone in on the unmistakable rat-a-tat-tat of machine gun fire, heavy artillery and high pitched whistles followed by explosive booms. “The sound of freedom,” murmured one village resident who hours earlier had enjoyed a band concert at Spreckels Park. But to Navy SEALs in training, this is no picnic in the park. The week is part of the First Phase of Basic Underwater Demolition/SEAL training that is designed to physically test and screen applicants. Hell Week is aptly named, attests Smith. Hell Week is designed to test the recruits’ will and fortitude, and they are pushed to their limits, and are kept awake for the duration of the combat exercise. Those who opt out need only ring a brass bell three times; by Hell Week’s conclusion, more than half have rung that bell. 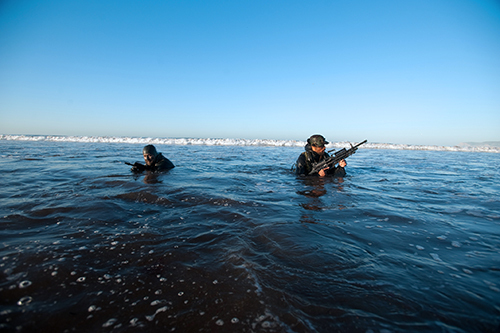 While SEALs need to be mentally and physically strong, “physicality doesn’t mean they had to be a linebacker on the high school football team,” Smith said, noting that the most important physical attributes are endurance and comfort in a water environment. Mental toughness is probably even more crucial than physical strength, Smith said. “We’re looking for someone who has an innate resiliency, a never-quit attitude. Someone who sees an obstacle as a challenge in a good way. SEAL team candidates are exposed to a battery of testing, including a computerized psychological test that measures mental toughness. Young men between the ages of 17 and 28 who think they might want to become a SEAL have a pathway toward that objective, said Smith. “A young man today can go in and talk to a Navy recruiter, who will assign them a mentor. If they have an interest in becoming a SEAL, they can get a contract to enter SEAL training.” In Coronado, that mentor is retired SEAL Lieutenant Commander Joe Fuller. First, however, they must pass a physical screening test that includes a 500-yard swim, followed by push-ups, sit-ups, pull-ups and a 1.5-mile run. They then go to either Officer’s Candidates School or the Navy’s boot camp at Great Lakes, Ill., where they’ll spend two months in the BUD/S prep program, taught by Olympic and collegiate coaches. Midshipmen commissioned from the United States Naval Academy and Navy ROTC are also selected for BUD/S training. Third Phase focuses on land warfare, with BUD/S students divided into small units where they are trained in marksmanship, demolition and weapons, including U.S. and foreign weapons. They integrate that training in a final month of operations at San Clemente Island, a Navy installation on the southernmost of the Channel Islands, about 75 miles northwest of San Diego. There, they are assigned squads, and given a series of missions. “Here’s where they gain experience in teamwork and leadership,” Smith said. Still, the potential SEAL has not yet earned his Trident, the gold colored uniform device that identifies a sailor as a SEAL. That will require another 26 weeks of SEAL Qualification Training that will take the skills taught in BUD/S to bring them up to a level where they are now prepared to join SEAL teams and be integrated into operational platoons. The site has won two major industry awards this year; an international media award as the top military website and the Chief of Naval Information’s annual Merit Award. On the site are training videos that help young candidates. This small table is set for one to symbolize the frailty of one prisoner, alone against his oppressors. The tablecloth is white, symbolizing the purity of their response to their country’s call to arms. Remember. The table is round to show that our concern for them is never ending.Remember. The Bible represents faith in a higher power and the pledge to our country, founded as one nation under God. Remember. The black napkin stands for the emptiness these warriors have left in their hearts of their families and friends. Remember. The single red rose reminds us of their families and loved ones; and the red ribbon represents the love of our country, which inspired them to answer the nation’s call. Remember. The candle and ribbon are reminiscent of the everlasting hope for a joyous reunion with those yet unaccounted for. Remember. The slice of lemon on the bread plate is there to remind us of their bitter fate. Remember. There is salt upon the bread plate, symbolic of the families’ tears. Remember. The chair is empty, depicting an unknown face, representing no specific Soldier, Sailor, Marine or Airman, but all who are not here with us. Remember. Remember, all of you who served with them and called them comrades, who depended on their might and aid, and relied upon them; for surely, they have not forsaken you.